Chalkboard paint is one of the hottest trends in interior design, especially for homeowners who are creative and maybe even a little bit kooky. While it may not be for everyone, those who opt for this design feature will find the possibilities it creates refreshing and fun. The black surface, combined with chalk and some imagination, transforms any room into a creative zone where residents can put their ideas directly on the wall. In this ideabook, we have put together several of our favorite chalkboard rooms. Get inspired by the great examples below and pick up some valuable tips from professionals before getting started on your own project. 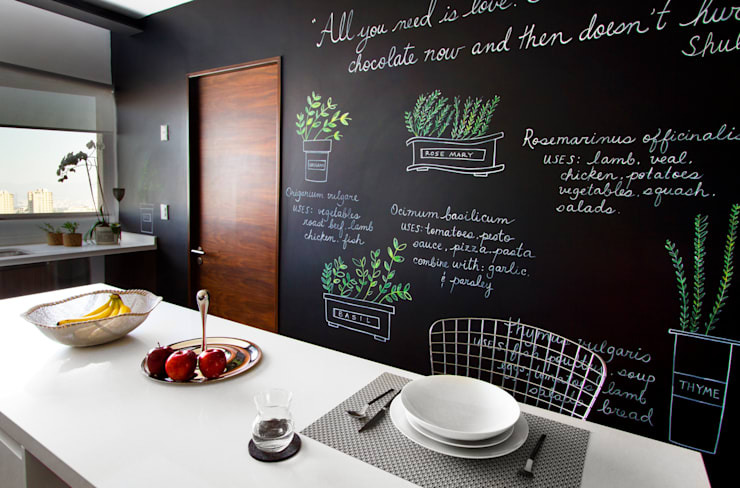 The dining room is a great place to showcase the chalkboard design. While black walls may initially be daunting, large windows and ample lighting will keep the room from being too dark for the residents. Having walls you can write on can be handy. During dinner parties, write down the menu here so your guests know what to look forward to. On regular days, the walls can display a number of different motifs and ideas such as fun drawings by the kids or your favorite inspirational quotes. 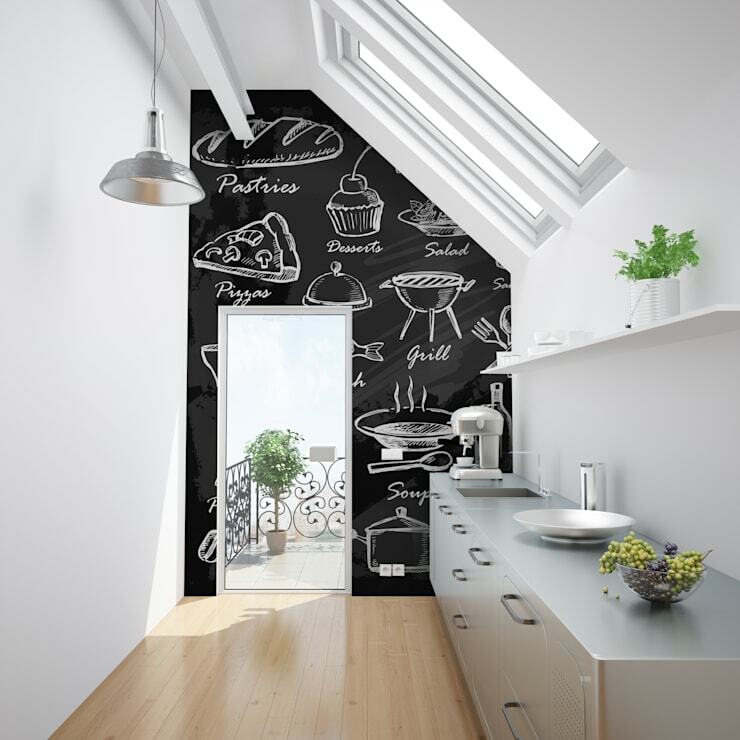 The kitchen is another popular spot to use blackboard paint in as it’s not only a great option for decorative purposes, but also for practicality. 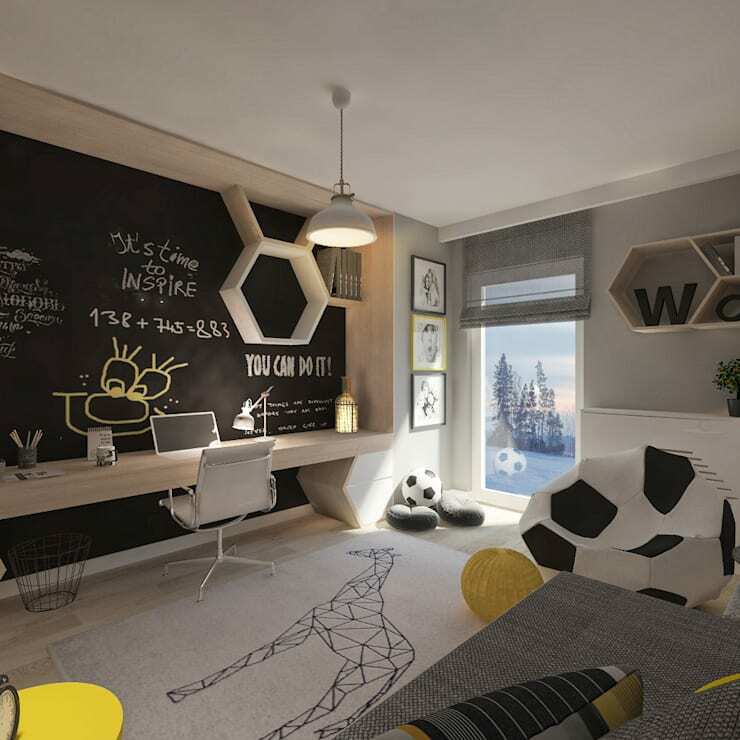 Here, the residents can jot down their grocery list, recipes or even to-do lists for the entire family. Because everyone naturally gravitates to the kitchen, it’s the perfect place to put these important lists – and blackboard walls make it impossible to miss. If you don’t have lists to remember, cute cooking-related graphics can also be drawn on the walls instead, as seen in the example above. There’s no need to limit yourself to walls. 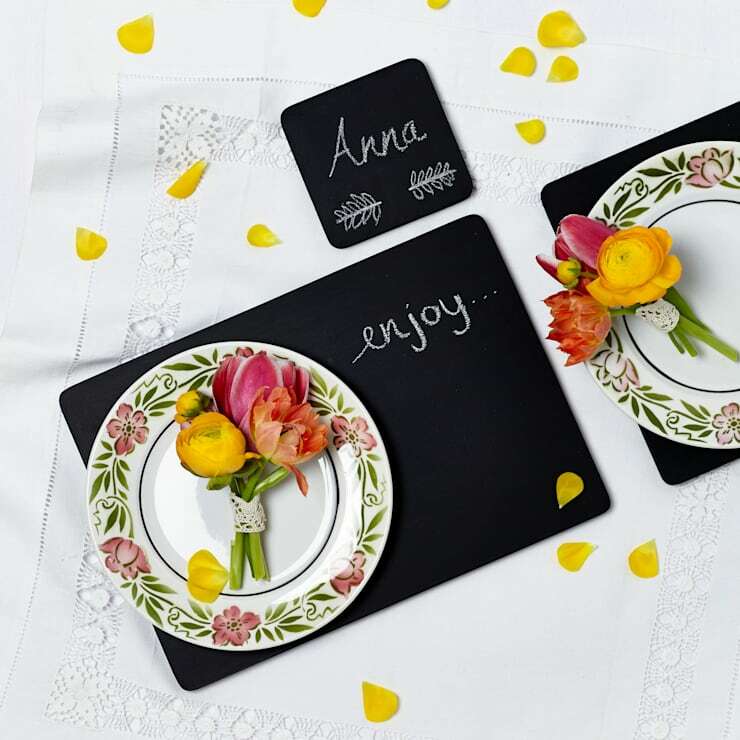 Chalkboard paint can be used in a variety of accessories, such as placemats and coasters. It’s a great way to personalize the table during parties and get-togethers, so that each guest know where they’re supposed to sit. You can even include a special message or drawing to make the experience even more personalized for your visitors. This is an easy and affordable DIY project that anyone can do. Chalkboard walls are also a wonderful addition to the rooms of the kids to encourage them to embrace their creative side. Give them the freedom to draw on their own walls and create their own design from spaceships and aliens to animals and cars. At the same time, writing lessons on the chalkboard walls – vocabulary, algebraic equations and the like – can make them easier to memorize for students. 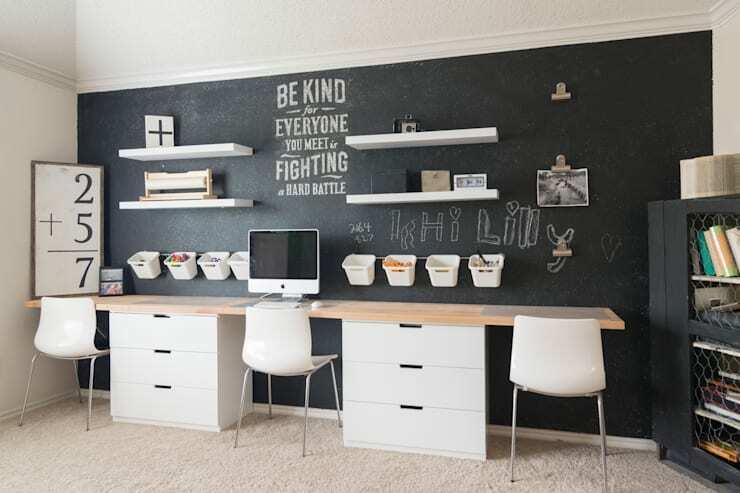 Chalkboard paint gives the home office or study a cool, modern touch, but it’s also quite practical. Like in the other rooms of the house, chalkboard walls here provide the residents a place where they can quickly jot down thoughts and ideas whenever they need to. During meetings or appointments, this could be handy as it offers a big enough writing space for multiple people. A motivational quote could also be written here in calligraphy to boost your will to work and study. 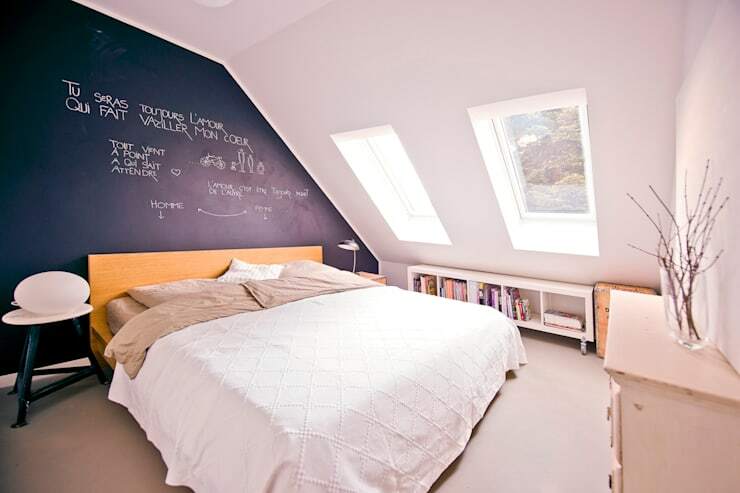 Finally, don’t be afraid to install chalkboard walls in your own bedroom. Because this is your personal space, chalkboards offer the chance to change your room’s look depending on your mood or whim. Invite your friends over and let them leave you messages here or even elaborate drawings. For creative individuals, a blank canvas such as this is the best design they could hope for. For more innovative ways to transform the look of your home, check out our 33 creative ways to renovate your house with little money.